Do you have a hyper hound who is hard to train? 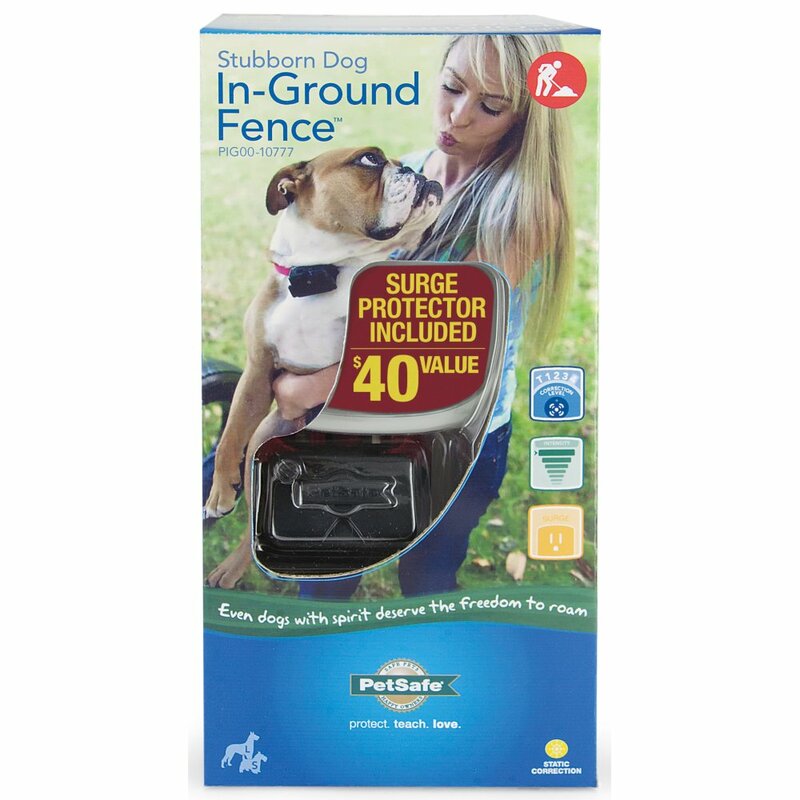 The PetSafe Stubborn Dog Underground Fence is quick and easy to install, reliable and safe, and a very effective solution. Some dogs were born to test limits. But the Stubborn Dog In-Ground Fence system sets firm boundaries that you’ll quickly train them to understand. Here’s how it works. 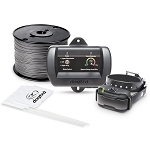 You’ll set the boundary by burying wires around the perimeter of your yard. Your dog wears a collar that picks up the signal from the transmitter. 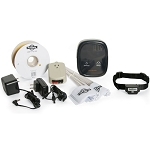 As your dog nears the boundary wires, a beep alerts your dog, giving them a chance to stop without any correction. For those that continue, a safe static correction reminds them to stay in the area you’ve established. Simply adjust the correction level if your dog continues to test the boundaries. After about 2 weeks of training, even the most stubborn dogs can start enjoying their new yard freedom! And for hearing-impaired or senior dogs who simply can’t detect the beep, there’s a special vibration mode. Your furry friends will certainly thank you for the extra help in keeping them safe! We have a pit bull rescue, could not keep him contained to the point we were going to have to take him back to the pound. Last ditch effort we decided to invest in the underground fence. It worked!!!!! Once we figured out the layout and how to create the neutral zones, the installation of the fence was fairly easy. Best part, our dog actually responds to just the beeping, we haven't had to even use the shock level of our collar. We highly recommend this fence and we are very happy that we tried this option before giving up. although mounting the control unit in a place above freezing caused some problems for me as far as installation, the unit works as advertised. I bought this package for an Anatolian/Kangal that liked to visit my neighbors and their dogs. I was afraid he was going to get hurt and wanted him to protect my property, not everyone elses. I have 10 acres so I wanted him to have access run the whole property, but no fence I had put up kept himn in. He barrelled right through or over them. I hated tying him up...he actually started eating my porch from boredom. Someone in my office recommended the fence. [...] I did all the research and was sold! It was amazing at how easy to set up, install (I ran it along the fence line), and train my very stubborn dog on. [...] I am now in the process of training my cats, much to their dismay! The only issue I had was the actual collar. It broke the first day from my dog getting his paw underneath it and pulling. I moved the radio onto a regular collar with very little effort and it works great.Thank you Petsafe and Radio Fence for a product that works better than advertised! The best thing we ever bought 4 our dog! This is the one product (we've used others) that really works for our dog. We replaced an older model collar, and after one trip into the "vibration only" zone, our dog stays back closer to the house, right where we want him. This is a great product, great service! This fence works great, wouldn't go without it. We enclosed about 15 acres, and have 2 dogs. Our German Shepherd took 2 times around the fence to figure it out and she won't cross it. Our other dog took a couple more times, but she finally got it. I would definately recommend this fence. It was a lot of work setting it up for a old lady and two 13 year old boys, but worth every dime and minute. We laid the 1100 feet of wire on top of the ground for location, tested it, spray painted the wire location, used the trench master, placed the wire in the trench, tested it, covered the wire with sand (35 70# bags), and then placed the flags. I also used conduit in several places in the gravel and across other wires and had to twist the two wires together for 35 feet to and from the control box. My two 1 yr old Boxer/German Short Hair Pointers learned in 3 days. Benji and Daisy really, really love it. I do not need to worry that they are in the street or have to chase them down for hours. Also, my kids love it, now they can play with their puppies in the yard. This allows both the puppies and my kids to play off their extra energy - a win, win situation for this old lady. I have a 6 month Cane Corso with high prey drive. I wanted to aid him in staying in his area and this foots the bill. I keep his collar on level one(vibrate) and he has learned his boundry faster then i could put the flags in. The only gripe I have is that it seems at times that the correction area is inconsistant. I had no issues installing the unit, or training Drake. I truelly recommend this unit to any dog owner. My neighbor and I have 8 acres (4 each) and we have three extra large dogs between us. We got a "wild hare" to install underground fencing on ALL 8 ACRES! We have 90% woods, with several streams and wetlands. The system works just like it said, we were innovative when going through the wet areas and everything has worked like a charm. All three dogs are trained and doing well with this system. Love it, Love it, It is a big hit! We live in a neighborhood on a 5 acre lot. Our dog Buddy needs to be able to be outside but with boundaries and this has worked perfect. I would highly recommend. Thanks for a great product. I recently bought I home that had an existing older RadioFence; however the transmitter was blown. I replaced the transmitter with a new one which works great; the only confusing thing was that the older system had a 3rd wire for a ground which the new transmitter didn't seem to accommodate. It was a bit confusing but I just left the ground wire out and it appears to work fine. We have a St. Bernard and have the system on the lowest setting and it keeps her around! There is one draw back; I have the width of the boundary warning turned up as high as it will go but there is little to know warning before the shock. I assume that is because my system incorporates about 4 acres. I have a shepherd/pit mix who is only a year old. He is a master escape artists. We live on about 5 acres and have chickens. The front yard was for our dog and back yard for chickens. Our dog didn't see it that way. After about the 10th time going after chickens and the fifth time of him just going off and exploring, I did some research. I know my dog and how hardheaded he is when it came to listening so I needed a system that would mean business. The electric fence for stubborn dogs did just that. It only took three days of learning the flags and shock zone and only three times trying to go after chickens or other wildlife. Now I can sit on the back deck with chickens free range and he stays put. Thank you for helping me keep our special guy where he belongs. It was easy to install and corrected the dogs behavior of always looking for a way out of the fence line. All the videos on the site made it easy to install as well as train my dogs, thank you for a well made and thought out produce. Q: what is the difference in stubborn dog to regular fence? The Stubborn Dog Fence Collar is made for larger breed dogs and has a stronger correction than the other other collars. If you have a smaller breed dog then the little dog collar would be more appropriate. If you have a larger breed dog like a lab or German Sheppard the Stubborn Dog would be the collar to go with. Q: We have 2 large Bassett hounds that we want the stubborn deluxe kit for.... BUT is there a kit that we can buy without the wiring? We already have #12 wire buried for the perimeter for the fence. Q: We have a 90 active lab and live in an area known for large amounts of snowfall. Our home is comprised of two city lots. Does this work in deep snow, and what gage wire do you recommend if we are burying it? I'm assuming the $199 kit is the complete system, correct? A: Yes it will work in deep snow, but you may need to turn the signal up to eliminate any interference. 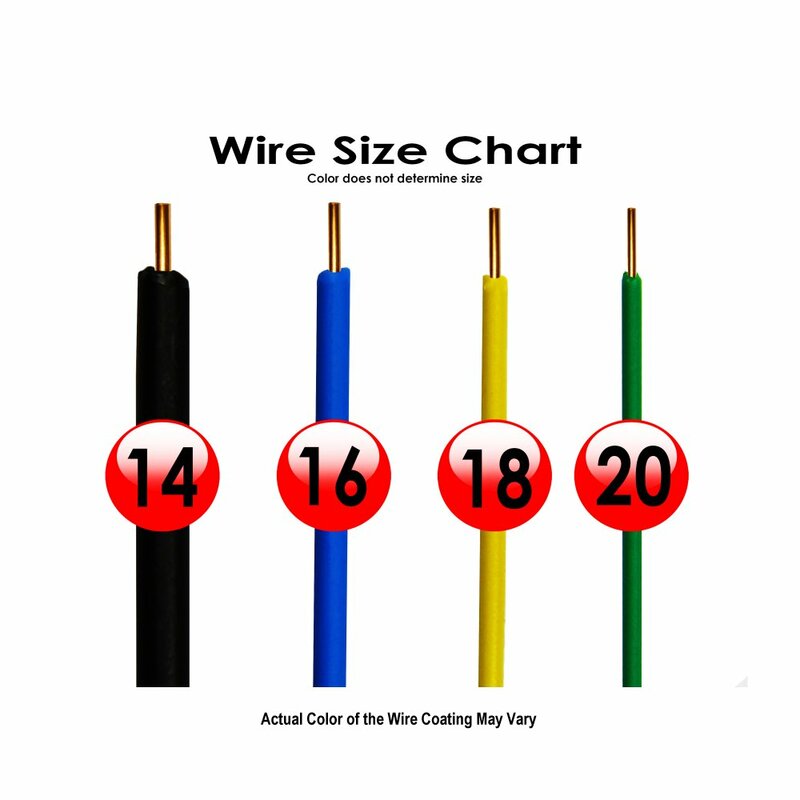 You may also want to use an stronger gauge wire than the factory grade wire to combat the severity of the elements in your area. And yes, the $199 kit is the complete system, but it will be extra if you upgrade the gauge of your wire. Q: In the description under features it says that the fence can cover up to 20 acres with additional wire, but then under what is included it says it can only amtdjp up to 10 acres with additional wire...which is correct? There was a typo on this product description. The Stubborn Dog Fence can enclose up to 25 acres. Q: We only need the 2 sides of our yard wired that are chain link. Back is concrete and front is 6' PVC fence. Is there instructions on how to split the wire but keep on same system? A: Yes, there is instructions on how to do a more complex installation like this. If you need additional assistance feel free to call us and we will point you in the right direction. Q: We live in an area that tends to flood from tropical storms, etc. Will the fence still work under a few inches and up to a foot of water? Or should we choose the wireless option? 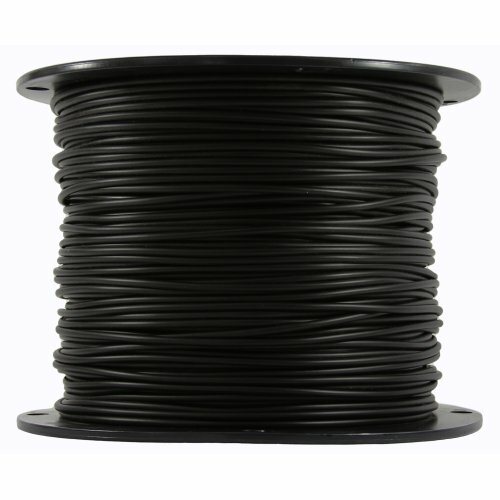 A: The wire will work just fine under water as long as there are no breaks in the wire or the wire coating. Q: We have an area that we would like to run an underground fence, however, it is a creek bed that is dry 95% of the year. Would it adversely affect the system if there were water in that area? 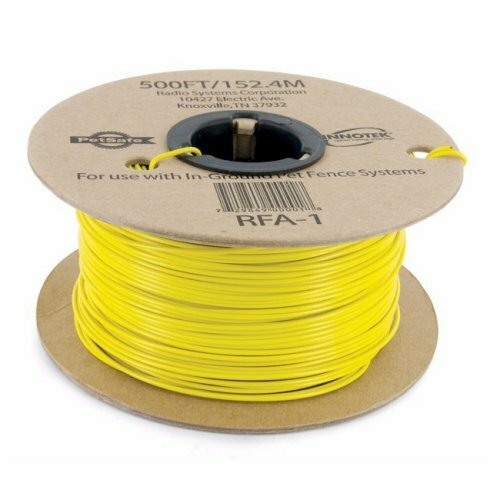 As long as the coating on the wire is in good condition and there is no breaks or holes in the wire this should not be a problem. 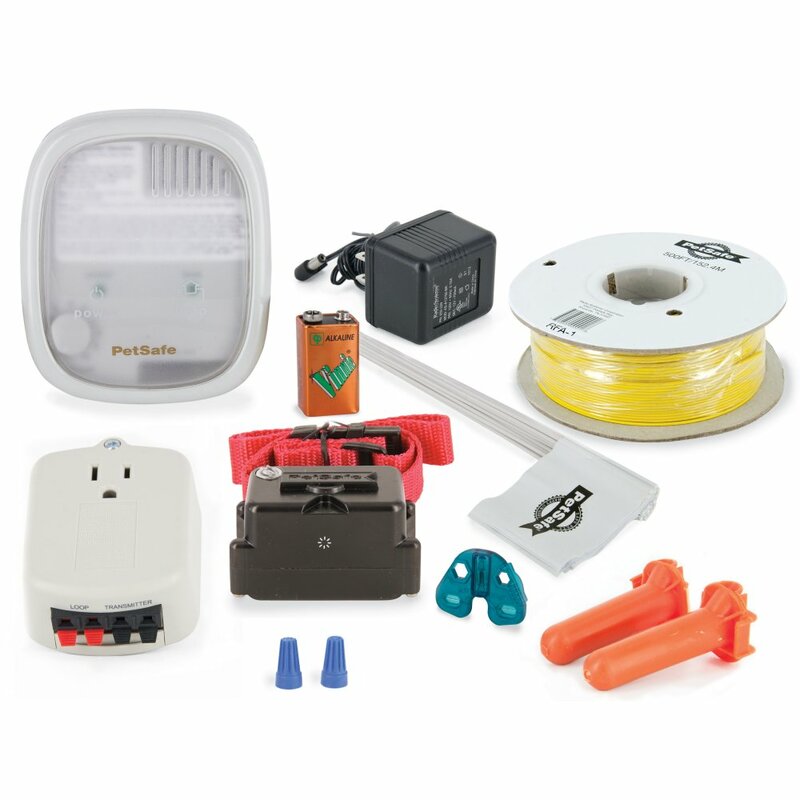 Q: We have an electronic fence system already installed and have been using petsafe collars. If we switch to this whole new system would we have to bury new lines? We need a stronger system, the dog keeps running outside. No you do not need to bury new wire. In short, if you are planning to attach the wire to an existing livestock fence, you shouldn't run into any problems. For a more detailed explanation we would recommend you give us a call at 800-941-4200. Q: We currently have an underground fence . That dog recently started running through The boundary, after eight months of using it . We have a pet that is somewhat stubborn . Does this particular unit give a higher jolt? What is the difference between your regular underground fence and a stubborn dog fence ? 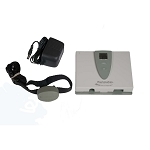 This unit can indeed be set to a higher correction level than the other PetSafe collars. The collar itself is the primary difference in the two systems. 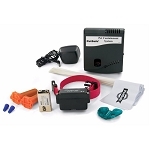 The Stubborn dog collar takes a standard 9 volt battery while the regular fence collar takes a circular shaped 6 volt battery. The stubborn dog collar is also equipped with a vibration mode that isn't available on the other collar.